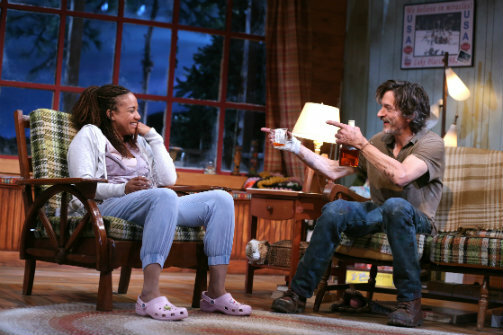 Tracie Thoms and John Hawkes in Lost Lake. Photo by Joan Marcus. BOTTOM LINE: David Auburn's new play takes a while to get going, but it's worth sticking around for the ending and a memorable New York stage debut from John Hawkes. There are a number of plays in New York City this season taking place in remote cabins like Jacuzzi, The River, and Lost Lake. You can see the appeal: small casts, opportunity for intrigue and mystery, potential for cool-looking sets. And in the case of Lost Lake, it offers the chance for Manhattan Theatre Club to reunite David Auburn and Daniel Sullivan, the playwright/director team behind Pulitzer Prize-winning Proof. But it's only at the very end that this slight play pays off. The plot is straightforward: Veronica (Tracie Thoms), a nurse practitioner, wants to rent a lakeside cabin for a vacation with her two children and daughter's friend for a week in the summer. In the first scene, she meets with the owner, Hogan (John Hawkes), to look at the shabby place and discuss price. They also go over the changes that Hogan will make before she arrives, like fixing the pool dock and a broken shutter and clearing out his clothes (because of financial difficulties, he's been living in the cabin himself). The only one of these promises he fulfills is fixing the shutter, but Veronica and the children (who are never seen) stay anyway and she tries to make the most of it. We learn more about Veronica and Hogan, who aren't being completely honest with each other or themselves, throughout, but the play doesn't really build because there isn't much conflict or dramatic tension. But the final scene was satisfying enough that I almost forgot why the play didn't feel substantial earlier. I won't go into too many details except to say it is very honest about life, connections we make, and problems we have to face. Still, the performances and set offer their own pleasures. Thoms and Hawkes are natural and believable in their conversations between two strangers thrown together. Hawkes, who was nominated for an Oscar for Winter's Bone, is especially mesmerizing, reeking of desperation with every movement of his lanky frame. J. Michael Griggs's set, which is remarkably detailed to the point that I was nervous about bedbugs in the ratty coach, offers plenty to look at, plus an inventive set change that I won't reveal here. At least that's something that you probably won't see in other plays this season.